It used to be a wooden coaster known simply as the Rattler—and not a very good one at that. 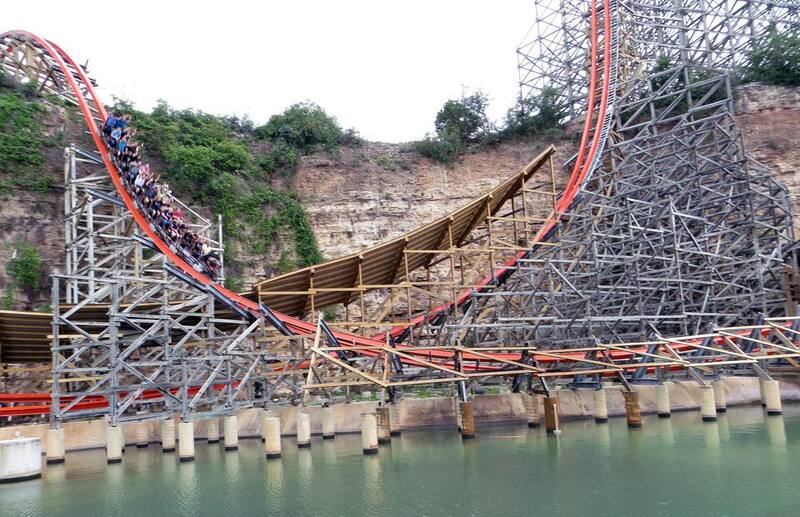 In 2013, Six Flags Fiesta Texas worked with a ride manufacturer to rip out the traditional wooden track, retrofit a snazzy orange IBox steel track (more on that later), and make a number of modifications to the structure (including a much longer first drop and, significantly, a barrel roll inversion—more on that later as well). And now? Not only has the park dramatically improved the coaster, it created a wonderful, remarkably smooth, thoroughly fun and enjoyable ride in its own right. Type of coaster: Hybrid wooden and steel; also a terrain coaster. Among its unique attributes, Six Flags Fiesta Texas is built on the site of a former limestone quarry and is surrounded by a 100-or-so-foot tall quarry wall. Like some of the park’s rides, Iron Rattler is situated alongside the wall, and the juxtaposition of the handsome, imposing wooden structure, now adorned with its bright orange track, against the multi-hued limestone rock face is visually stunning. Riders enter the queue between two sculptures of a snake’s head and its rattler tail and encounter a vehicle outfitted with snake wrangler paraphernalia while, um, snaking through the line. To get to the loading station, they make their way up stairs with railings painted the same electric orange hue as the coaster’s track. The trains, made by noted wooden coaster car manufacturer Gerstlauer Amusement Rides, use polyurethane wheels (the kind typically used on traditional tubular steel coasters) to accommodate the all-steel track. A rattler head adorns the front of each train, and—you got it—a rattler tail is affixed to the back. The seats, which are arranged two across, are quite comfortable. A single bar, which rests against passengers' laps and includes shin protectors, is the only restraint. Although the coaster includes an inversion, it does not have over-the-shoulder harnesses. A single knob on each passenger’s lap bar, which almost looks like the horn on a saddle, gives riders who refrain from holding their hands up (like me) something to clutch. The train leaves the station, rounds a bend, and begins the ascent up the 179-foot lift hill. While not as fast as the elevator cable lifts on those coasters that feature them (such as El Toro at Six Flags Great Adventure), the chain lift seemed zippier than a standard coaster. As the train nears the top, however, the lift slows to almost a crawl, adding dramatic flair and heightening anticipation for the madness that is about to ensue. Riders in the middle and back of the train get a mild adrenaline rush as the train nearly stalls, but those in the front of the train get the full effect as they hang perilously over the edge of the hill and stare into the quarry basin far below. When the train finally does release, the first drop is a delirious delight. The track banks and curves slightly to the left as riders plunge nearly straight down and reach a top speed of 70 mph. When it first opened in 1992, the original Rattler dropped 166 feet, which made it the longest drop for a wooden coaster at the time. But when it quickly gained a reputation for its excessively rough ride, Six Flags reduced the length of the first drop to 124 feet to try and improve it. After truncating the drop, the coaster still had a venomous bite and a crummy reputation. The folks behind the makeover must have really had confidence in the IBox steel track. Not only did they restore the length of the drop, they added a few feet. This fangs-bared monster now plummets 171 feet. And its 81-degree angle of descent makes for an especially precarious humdinger of a drop. Thank goodness for the hang-on-for dear-life post on the lap bar. For people who love roller coasters, intense in a good way is a good thing, and Iron Rattler is loaded with intense, very good things. It takes its 179 feet of pent-up energy, the 171-foot first drop, the 70-mph race to the heavens with its wicked surge of airtime, and everything else that follows in stride. There is no shudder, no shimmying, no screeching, no herky-jerky, bruising body blows. No nothing but a wonderful (if intense in a good way) ride. For that, kudos have to be extended to Rocky Mountain Construction, the ride manufacturer and engineering wizards that both constructed the reborn ride and developed the IBox steel track that it also calls its "Iron Horse" track. As its name suggests, the track consists of I-shaped beams of steel with channels created by the tops and bottoms of the "I" into which the trains’ up-stop wheels fit snugly. Thanks to the voodoo behind the design breakthrough of the IBox track, what had formerly been an infamously rough ride is now a famously smooth ride. But Iron Rattler does its giant Texas sister one better: It goes upside down. Sure, tubular steel coasters have long included inversions, but they can be notoriously rough sometimes. Given Iron Rattler’s near-hypercoaster stats, the silky smoothness of the barrel roll inversion on this IBox-enhanced ride is all the more remarkable. After tearing through its first airtime pop at around 70 mph, the coaster remains up near the top of the quarry, curves around and enters the barrel roll with acrobatic grace. If coaster inversions were an Olympic sport, the judges would all hold up “10” cards after the ride uncoils its twisted element with aplomb. Emerging right-side up from the inversion, the train races up and over the top of the quarry wall. It delivers some powerful (but, again, smooth) lateral g-forces as the track banks severely to the right and the left. There are also a few more airtime bursts courtesy of some small hills. The ride begins losing a bit of speed here, and in the confusion of the moment, passengers may think that the coaster has nearly reached its nadir and should be returning to the station soon. But as it races back over the edge of the wall, they are reminded, ”Oh yeah. We’ve been on top of a 100-foot quarry cliff for the past few moments, and…wait a sec!" The final drop into the quarry is unexpected, long, and potent. A synchronized geyser of water erupts on the quarry floor (when it works) to punctuate the drop. The train races toward the quarry wall and into a tunnel bored into its side for a disorienting few moments of semi-darkness and flashing light effects. Riders emerge back into the daylight and hurtle into an assertive brake that abruptly halts the action. Iron Rattler then slithers back into the station. Have you ever petted a snake? Despite conventional wisdom, the scaly creatures do not have rough skin and are actually quite smooth. Forget past history and the conventional wisdom that a wooden thrill machine of such huge proportions must impart a punishing, rough ride. Intense in a good way? Sure. Prepare to be surprised and blown away by this hybrid’s wonderfully smooth ride.